Name: Albert Arnold Gore, Jr. Birth: March 31, 1948, Washington, D.C., the son of a moderate Democratic U.S. congressman and later senator from Tennessee. Claim to Fame: Served as U.S. congressman from Tennessee’s 4th District from 1977 to 1985, where he became the first congressman to appear on C-SPAN and “invented the Internet” as sponsor of the High Performance Computing and Communication Act of 1991; served as U.S. senator from Tennessee from 1985-93; ran for the Democratic nomination for President in 1988; was elected Vice President on a ticket with Bill Clinton in 1992, and served until 2001; ran for President against George W. Bush in 2000 and received a majority of popular votes cast, but lost the electoral vote to Bush after a ballot recount in Florida and a controversial decision by the U.S. Supreme Court in Bush’s favor; retired from politics (mostly) to become an activist on global warming issues; in 2007, Gore’s film, An Inconvenient Truth, won an Oscar for Best Documentary Feature; and, also in 2007, he won an Emmy for his role in founding Current TV, and the Nobel Peace Prize. Power Base: 50,999,897 disappointed American voters in the 2000 presidential election; environmentalists; and, apparently, members of the Academies of Motion Picture Arts and Sciences and Television Arts & Sciences and the Nobel Committee. Merits: There has been a definite spike in searches for “Al Gore antichrist” landing people here on this site since Friday’s announcement of the former Vice President’s Nobel Peace Prize, prompting us here at the Cocktail Hour to take another look at his antichrist candidacy. We first alluded to Al Gore’s merits as the antichrist back in July 2006, when we quoted Christian radio host Woodrow Kroll on the possibility of the antichrist being a popular environmental leader. This notion was consistent with the statement, in March 2007, by 78-year old Roman Catholic Cardinal Giacomo Biffi that the antichrist will be “a pacifist, ecologist and ecumenist” that “the masses” will follow. Along similar lines, other commentators note that, since the numerical value of W is ‘6,’ and “www” is the equivalent of “666,” as the “inventor of the Internet,” Al Gore has the mark of the Beast. 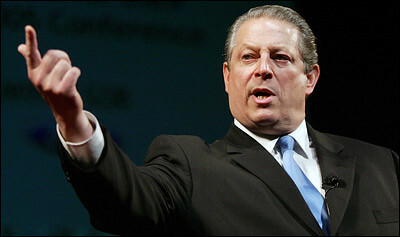 Gore, in his book Earth in the Balance, wrote that “we must all become partners in a bold effort to change the very foundation of our civilization,” a suggestion that writer Samantha Smith assails as advocating a New World Order, one “who would strip America of its progress and industry, incorporate population control, establish an international police guard to enforce compliance of international laws on the environment, and lead a battalion of interfaith advocates in earth stewardship–rationing the ‘sacred’ earth’s resources.” Smith sees these ambitions as being consistent with the spiritual goals of a New Age Movement that would denounce God in favor of a worship of nature. Quay Fortuna’s Analysis: The fact that a Republican tells Rolling Stone that Al Gore is “cool” does not make it so — although, you have to admit, it’s like he became a new person after 2000. His remarkable transformation, however, only really supports the notion that he sold his soul to the devil right after the 2000 election. I mean, come on, would anyone have predicted that Al Gore could have ever received an Oscar, an Emmy, and a Nobel Peace Prize, let alone in the same year? Anyone taking odds that he might win an Olympic gold medal? Don’t bet against it! Those with short memories have already forgotten that his popular vote in the 2000 election was a close one, and that even many Democrats were disappointed with Gore as a presidential candidate at the time. If we must, as the scholars suggest, see the antichrist as a charming and beloved figure, we must ask ourselves the following question: Is it possible that before his election loss in 2000, Al Gore would not have been capable of being the antichrist, but now that he’s a Hollywood celeb and talk show bon vivant, he is now suddenly capable of being the antichrist? I think the preferred view would be that the antichrist is going to be the antichrist from birth onward. And no antichrist worth his salt would have allowed himself to be so overshadowed by the devilishness of Bill Clinton for eight years. Al Gore has been awarded the Nobel Peace Prize for his efforts to raise awareness about global warming … which is all well and good until the U.S. Supreme Court decides to declare George W. Bush the winner instead. Rise of Global Warmth, Rise of the Antichrist? And suddenly the Antichrist says, “I can explain everything that’s happening.” And people are so desperate for answers they fall down and worship anybody who can give them an answer. Now, is his answer true? Well, of course not; he’s a liar! But these people don’t know that. He’s telling them what Satan told him. And remember, Satan is the father of all liars. So, what is this person doing? This person, this Antichrist, this human being is now the mouthpiece for Satan. He is speaking for Satan. Wait — is he talking about Al Gore? Talk about an inconvenient truth — imagine how inconvenient it would be if Al Gore were the Antichrist.